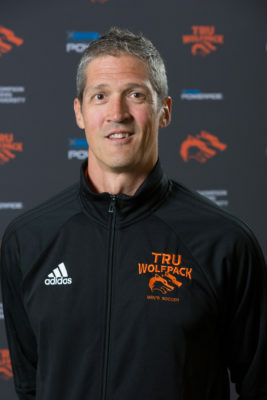 The departure of Ken Olynyk from the WolfPack has already led to a few changes in TRU’s athletics programs – one of them being the appointment of Peter Soberlak as the department’s new athletic performance advisor. Soberlak is a former professional hockey player and an assistant coach on the men’s soccer team. He’s also a lecturer at TRU, teaching sports-related courses. A very positive individual, Soberlak uses his experience as a former hockey player to help athletes deal with the pressures of sports and this is evident with his history of being a consultant with the Kamloops Blazers hockey team. He will be TRU’s first athletic performance advisor in the university’s history. It is a position that TRU hopes will help take the program to the next level in college sports. Soberlak comes across as a genuine person with good intentions. His eyes light up when it comes to discussing sports and how to go about maximizing an athlete’s potential. When Ken Olynyk announced his retirement, Soberlak showed interest in replacing him, and although that wasn’t meant to be, discussions took place to have him join the organization as the athletic performance advisor. As per his new position, Soberlak will be counselling and working with athletes and coaches from all the WolfPack programs. Soberlak went on to state that he might start the job by focusing on one program at a time, with his focus being helping athletes with self-confidence and positive self-talk. “Developing student athletes, that is my focus,” he said, “The priority will be to help them be successful in the classroom. Athletic performance is almost equally important,” Soberlak said. Soberlak explained that his schedule has been designed in such a way that allows him to do his job effectively and efficiently without any conflicts to worry about. He also emphasized his passion and love for the job TRU wants him to do, a job which he admits he is very grateful to have. Soberlak plans on continuing to work with the soccer program albeit in a more reduced capacity than previous seasons. “I like to be involved. It’s a fun aspect of the job,” he said. The WolfPack program has improved tremendously over the few years and Soberlak hopes there can be even more improvements to come. “Everything needs improvement. I’m sure there are a lot of areas we could be doing things better. At the same time there has been a lot of growth with TRU athletics,” Soberlak said.